Q. Several trees on my property were damaged during recent storms. Some just lost a few limbs, but others are split along the trunk. How can I tell whether the trees can be saved or if they should be cut down? What kind of pruning paint should I use on the broken branches? – I.P., Bartholomew County, Ind. A. It can be difficult to decide whether trees with severe damage should be removed. The first priority should be safety. Assess whether the tree or some of its branches are in danger of falling now or in the near future. If the tree is not an immediate danger, you may be able to plant a new tree nearby and wait for it to grow a bit before removing the old tree. 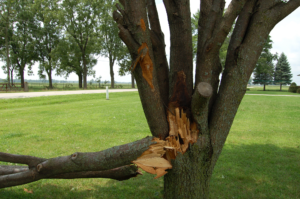 Small trees with minor damage can probably be taken care of by the homeowner, but large, mature trees likely will need the help of a professional tree arborist. Pruning sealants or paint are not recommended for treating pruning wounds – generally they have not been shown to be helpful and may actually interfere with the tree’s ability to form protective callus tissue over the wound. Q. I am planting a tree requiring acidic soil. My soil is subdivision clay, pH 7.5 – 8.0. How can I acidify the soil prior to planting the tree root ball? – J.S., Charlestown, Ind. A. Lowering soil pH is a challenge, especially for a large area of soil. The amount of product needed will depend on the starting pH, the target pH, and the soil type, with clay soils requiring more product than sandy soils. For large areas, elemental sulfur is the most commonly used product. Depending on the target pH your new tree requires, it might take 3-4 pounds or more of sulfur per 100 square feet, and that won’t make a permanent change. It will likely require annual or semi-annual applications of sulfur to maintain the desired pH. You did not mention which tree species you are planting and that is a significant factor. For some species that develop interveinal chlorosis due to iron deficiency in alkaline soils, fertilizing with chelated iron or direct application of iron through trunk injections can get around the problem of alkaline soil. But in general, it would be more practical to choose a species that is better adapted to your soil’s pH rather than fight nature. While a soil pH of 6.0-6.5 is considered ideal for most tree species, many can tolerate up to 7.5-8.0. Species to avoid on alkaline soils include pin oak, red and sugar maples, river birch, sweetgum, and bald cypress.